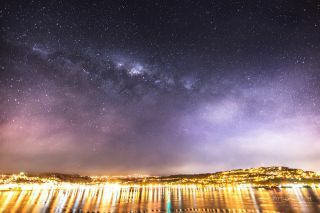 The Milky Way shines over the bright city lights of Wellington, New Zealand in this stunning image from a veteran night sky photographer. Astrophotographer Mark Gee captured this view of the Milky Way over Evans Bay near Wellington in early June. Unlike some stargazers, who sometimes travel great distances to capture memorable space images, Gee simply stepped outside. "I didn't have to go far to photograph this one, as I shot it from my balcony," he said. Gee said the shot required care to get right, adding that he had to walk a fine line between overexposing the city below and underexposing the dark night sky. Gee used a Canon 6D camera with a Canon 14mm f/2.8 lens, with settings of a 10-second shutter, aperture of f/2.8 and a ISO of 3200 to capture the image.